Clean air and fresh food. It is the perfect combination that the international supermarket chain Netto, in collaboration with KP Logistik and Scania, has achieved during the launch of an environmentally friendly and quiet truck that runs on HVO Renewable Diesel from Biofuel Express. The new trucks ensure that residents of urban areas can enjoy fresh food, without noise and pollution. At the same time, it contributes to Copenhagen municipality’s goal to be a CO2-neutral capital by 2025. 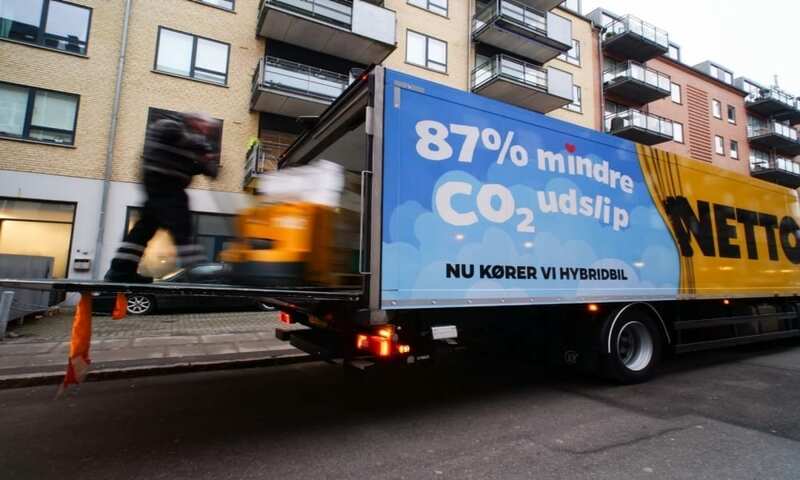 Netto and KP Logistik have replaced the normal diesel with fossil free diesel HVO, which has several advantages for the environment and the residents of the urban area. HVO Renewable Diesel reduces CO2 emissions by up to 90%, is odourless and emits fewer local particles – ensuring higher air quality. HVO Renewable Diesel can fully replace normal diesel and can be used directly in diesel engines, without any modifications or adjustments to the engine. In addition to Scania, HVO is also approved by MAN, Volvo, Mercedes etc. HVO is a 100% fossil free diesel alternative, and a so-called 2nd generation biodiesel, based on waste products. Contact us today to hear more about the benefits of fossil free diesel HVO from Biofuel Express, or read more about HVO at www.biofuel-express.com/hvo. The chosen solution is a hybrid from the Scania P-series, where they have added silent components for the truck and its equipment.